This time of year, I always gather lilacs and make lilac vinegar with them. It’s easy to do. You just put lilac blossoms in a jar and cover them with vinegar. I use a cup of vinegar for every cup of flowers. I let the mixture steep for a week or longer and then strain out the blossoms. Any 5% strength vinegar works fine. I kind of like apple cider vinegar. I decided to use some of this mixture to make jelly this year. The color of the vinegar is a light pink color. The cooking process changed it somewhat and it came out a light honey color. Very pretty. 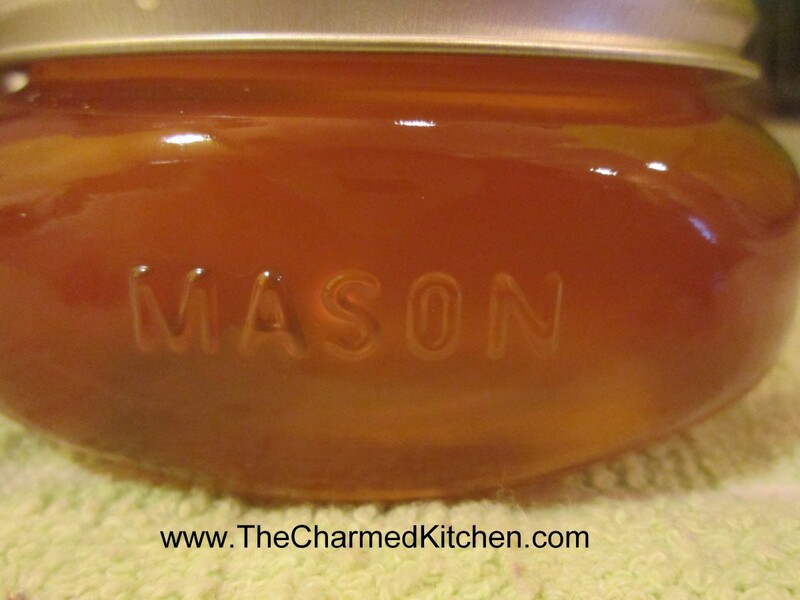 By using vinegar as the base, the jelly has a nice combination of tartness with the sweet. I could see using it on toast or as a glaze for meats. 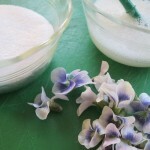 You can use the same recipe for violets and roses. Wash and prep jars and get water bath heating up. 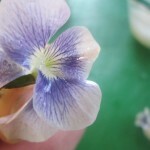 Place violet vinegar in pan and add lemon juice and pectin. Bring mixture to a rolling boil over high heat. Add sugar and return to the boil. Stir often. Once mixture gets to a full rolling boil, boil 1 minute. Remove jelly from heat and skim off any foam. Ladle hot liquid into jars leaving 1/4 inch headspace. Wipe rims and adjust lids. Process in a boiling water bath for 10 minutes for 4 oz. and 8 oz. jars. Remove jars to cooling rack and check seals once they have cooled down. Yield: about 7 half pint jars or 13-14 (4 oz.) jars. I was teaching a class on cooking with honey. I made these muffins. Since dandelions are blooming now, it seemed like a good choice for last night. The class really enjoyed them. The curious name for this recipe comes from my own curiosity. I wondered just how many blossoms I would need to get about a cup and a half of petals. I decided to make muffins with some of the dandelions blooming in my yard. I have a lot of dandelions, and I wanted to use a really decent amount in my muffins. I started counting as I trimmed them and stopped when I had a cup and a half. It turned out to be 100 flowers. So now, if you want to make this recipe, you will know when you can stop picking!!! If you can’t beat them, eat them. I actually am a big fan of dandelions. I have organized dandelion cook-offs and edited a dandelion cookbook. I eat the leaves, and a tea made from the roasted roots. 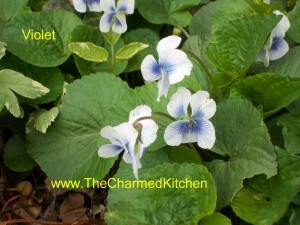 The flowers are a wonderful ingredient in cooking, too. They are used to make dandelion wine and I enjoy adding them to fritters, pancakes and other baked goods. 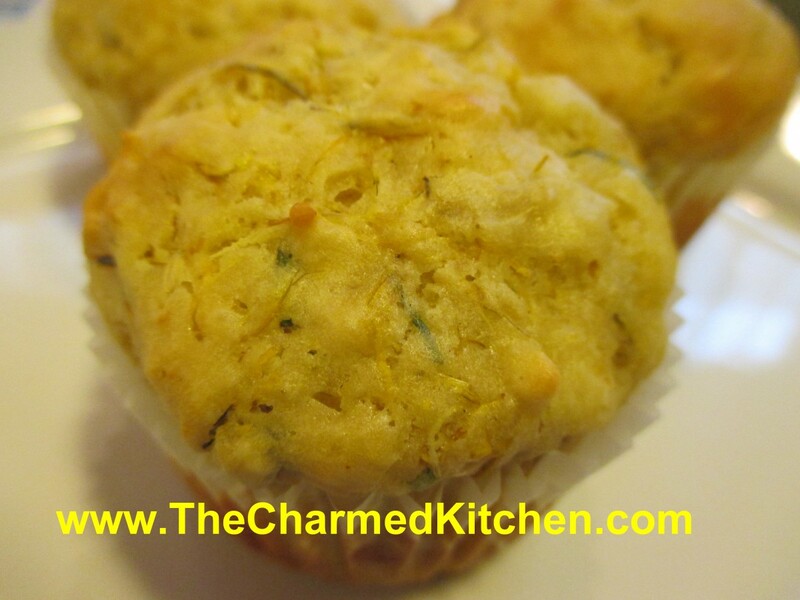 So here is my recipe for dandelion muffins. They are pretty tasty, tender, light and not too sweet. Preheat oven to 375 degrees. Line 12 muffin cups with paper liners or grease them, set aside. In medium bowl, combine flour with baking powder and salt and set aside. In another bowl, combine egg with half and half, honey, butter, vanilla and orange zest. Beat by hand until well mixed. 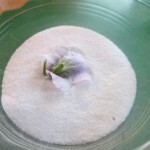 Stir in dandelion blossoms, then stir in flour mixture. Do not over mix. Stir just until flour is mixed in. Spoon batter into prepared pans, filling them about ¾ full. Bake for 20 minutes or until lightly browned on top. Great served warm with butter and honey. Makes 12. 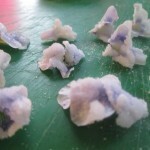 * To prepare the dandelion blossoms you want to trim of the tough base and just use the petals in the recipe. 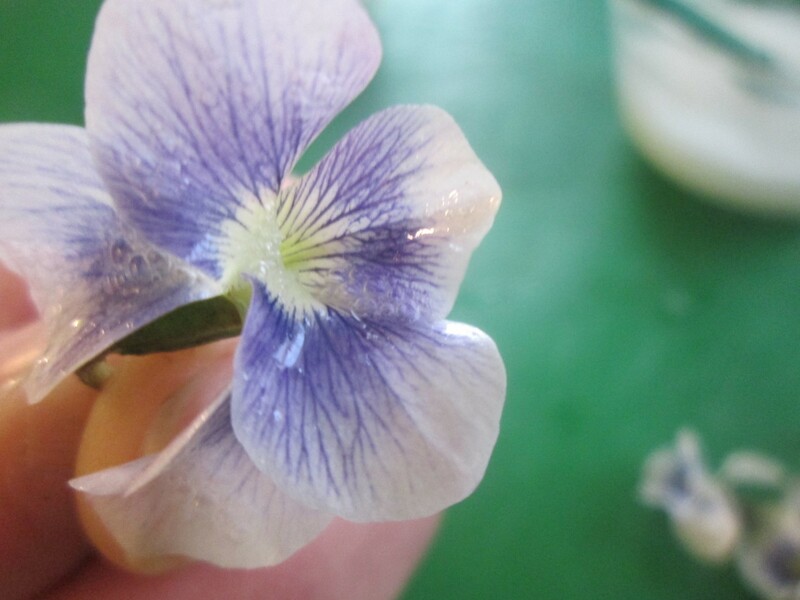 Some of the green sepals will get mixed in, and that is OK. Measure the petals after trimming. I picked 100 flowers and ended up with about 1½ cups of petals. 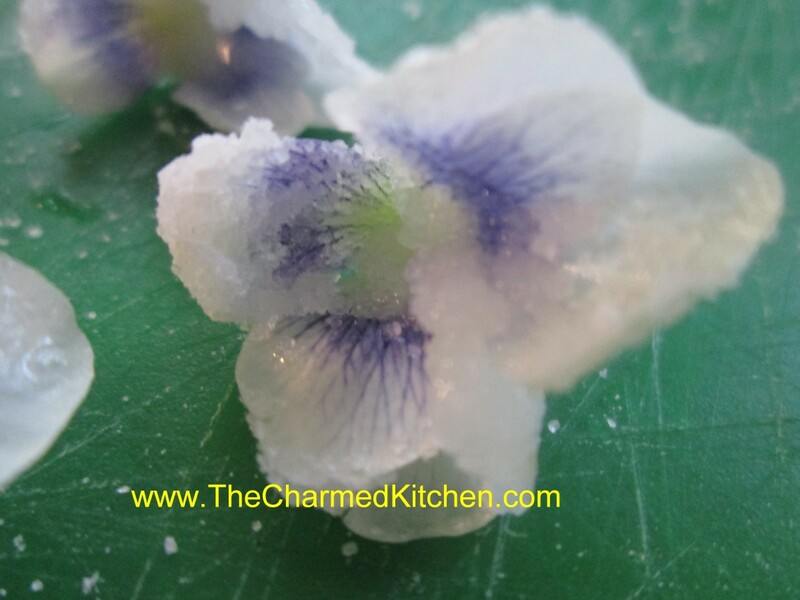 I love to make candied violets. It’s an easy way to enjoy these delicate flowers throughout the year. I recently posted a lemon cake decorated with candied violets. Several people asked me how to make them so I thought I would share the directions. I like to use them to decorate baked goods. Lovely on a cake they also add a sweet touch to cupcakes. Following package directions reconstitute egg whites to the equivalent of one or two egg whites. You can dilute them a little to make them easier to brush on. 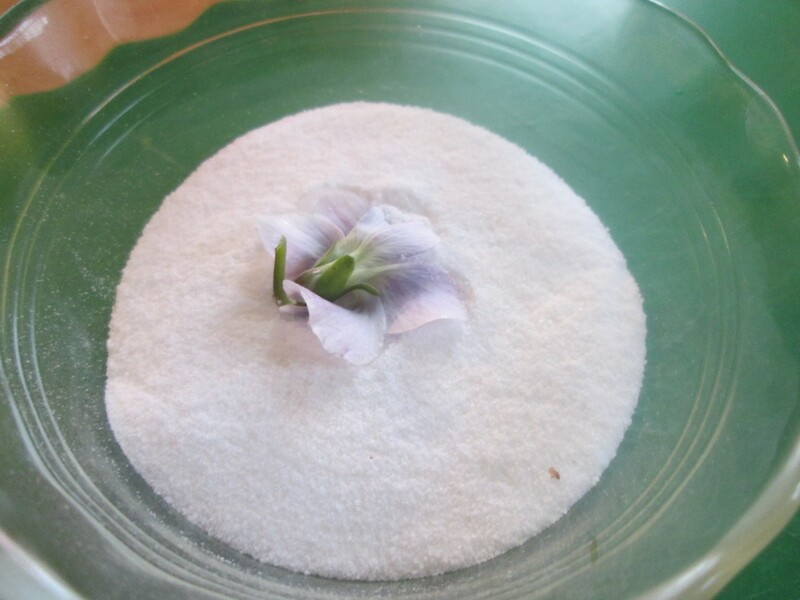 Place sugar in a shallow bowl. 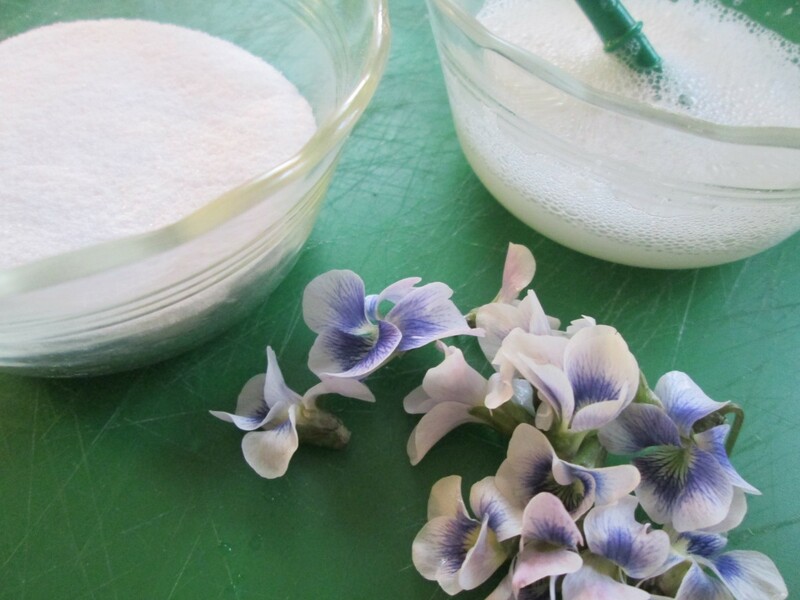 With a food-grade fine brush coat a violet with the egg white and press into the sugar. 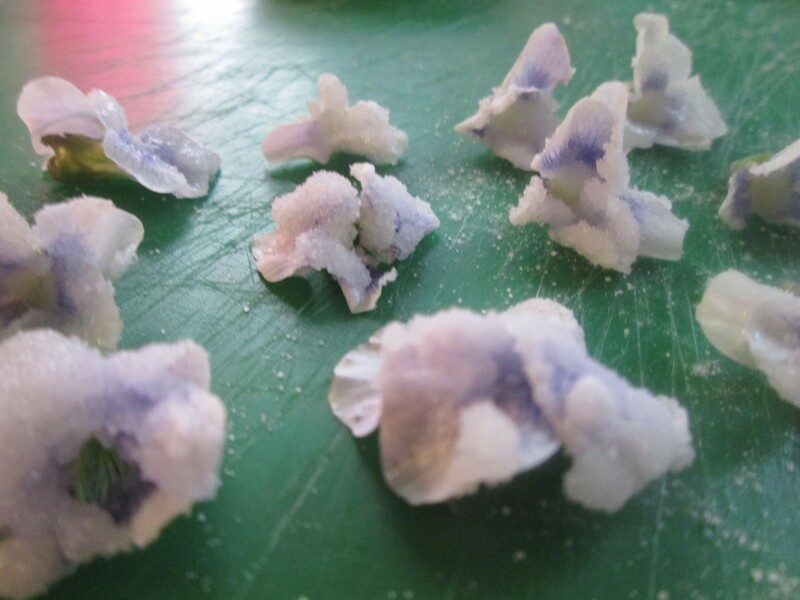 Place on wax paper and repeat with remaining flowers. Allow to dry for about a week. Store in a container with a tight fitting lid in a cool place. I like to store them in the freezer. Note: While some people use raw egg whites in these it is a better idea to use powdered egg whites which will have been pasteurized and therefore not a risk for salmonella. Note: You can use regular granulated sugar if you do not have superfine or you can pulse granulated sugar in a processor a few times to make superfine sugar. Don’t over process or you will end up with powdered sugar.